Three renowned performers of Eastern European Jewish music come together in this exceptional new trio: Lorin Sklamberg, co-founder of the legendary Klezmatics; uniquely innovative clarinettist Merlin Shepherd, and the remarkable vocalist/pianist Polina Shepherd, originally from Siberia. Each performer represents a different nation, yet their backgrounds are closely related, with their ancestors emigrating to find a better world elsewhere. This fresh collaboration blends traditional and contemporary Yiddish and Russian song with klezmer (originally Eastern European Jewish wedding music). Influenced by several cultures and maintaining individual styles, the trio plays original and traditional material with freedom and spontaneity. With mournful solo clarinet, bouncy village songs and some fiery vocals, their performance takes us on a breath-taking musical journey that is full of spirited joy and deep emotion. Klezmer’s original context as dance music for weddings and other Jewish celebrations means the music is often highly upbeat, suited to audiences looking for a fun night out. In recent decades it has – like Balkan music - become increasingly popular on the retro dance and club scene in the UK. Lorin Sklamberg is the founding member and lead vocalist for the legendary Klezmer band The Klezmatics, ever since their conception in the mid-1980s. Music critic Robert Christgau has described Sklamberg’s voice as “transcendent, ethereal and sensual”. Merlin has been called “Britain’s finest Klezmer clarinettist” by Songlines Magazine and is one of the most respected klezmer performers in Europe. Polina Shepherd has an extraordinary voice and a powerful stage presence. Her singing, though rooted in East European Jewish and Russian song forms, has a unique quality that has also been influenced by Islamic ornamentation and timbre. Sklamberg & The Shepherds are at The Apex on Sunday 2 April at 7.30pm. 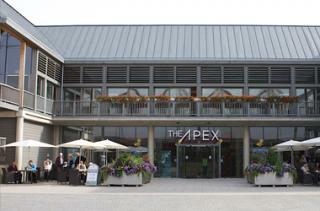 Tickets are £12.50, or £5 for those aged under 25, ring the box office on 01284 758000 or see the website - www.theapex.co.uk for details.